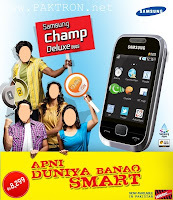 Samsung Champ Deluxe Duos (also known as Samsung C3312 Duos) is the latest mobile phone from Samsung Pakistan. C3312 Duos is a low bodget / mid-range mobile phone with Samsung's Original Dual SIM Technology (Both SIMs works at the same time). 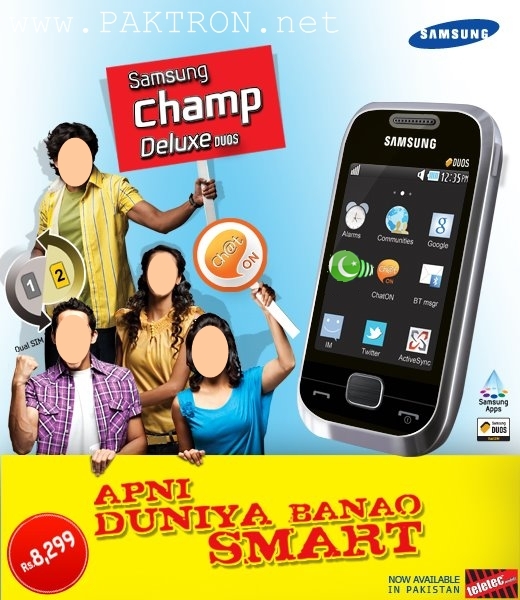 The New Samsung C3312 DUOS mobile phone is an affordable Dual SIM mobile, with dual stand-by, in Pakistan. It features like a 2.8 inch TFT Touch Screen display, 3.5mm standard audio-jack, 1.3 MP, MP3 player, FM Radio, internal memory and support external memory by micro SD card. Samsung Champ Deluxe Duos or C3312 Duos also supports Bluetooth, WAP and USB data connectivity and powered by standard battery. Samsung C3312 DUOS Price in Pakistan: EC3312 Duos Price in Pakistan is Rs. 8299 /- only. C3312 Duos is available in three color models (black, white and silver) and it comes with Teletec Mobile Pakistan warranty.